The day was a surprise of above 40 degree temps. Neighbors I hadn't seen in months came out from their winter hibernation. Garden accoutrements that were buried by the snow were peeking through the snow melt. The neighborhood came alive and became very wet. 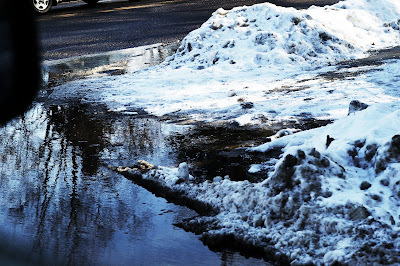 The street corners started to flood because the snow melt had no where to go.